Mission statement- we inspire, educate and outfit for a lifetime of outdoor adventure and stewardship. At the top right corner of the page is the standard shopping cart, “log in”, and “register” option for new or existing members. There are two small rows of navigation links below the main site logo and search bar. All four pictures of the slideshow reiterate the upcoming winter season and need for new winter apparel. 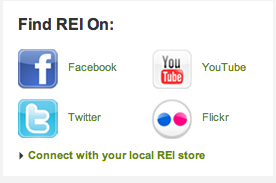 Towards the bottom of the site, it breaks into three columns: The left column is for deals/savings, the middle column is for the REI blog, social media integration options, and mobile app, and the right column is for REI membership benefits. Audience: Both men and women (members and nonmembers) who are outdoor enthusiasts and can afford higher quality camping and hiking gear. Business/Site Goals: To purchase gear and apparel through their website and increase membership. 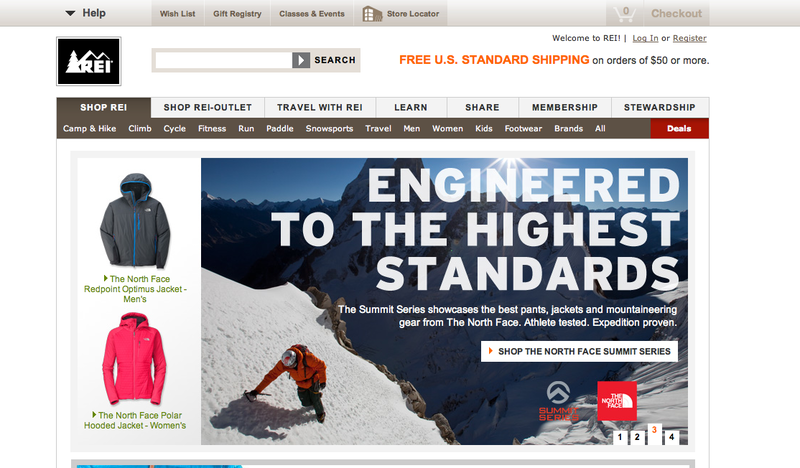 REI’s 2011 revenue was more than $1.8 billion with 11,000 plus employees, more than 120 retail stores in numerous states, and over 4.7 million active online members.